The finals were played on Thursday 11 May 2017. Thanks to all who supported the tournament. There were 25 entrants and a full viewing balcony for the finals. Those who attended were treated to 3 excellent and highly competitive matches. Neil took the first game with his usual supply of crisp hitting and volleying like he was trying to smack the dots off the ball. 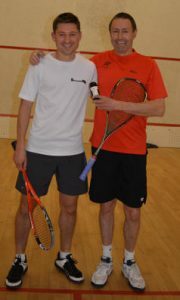 Simon battled well but Neil was too strong and went 1-0 up. Fortunes changed in the 2nd and 3rd games and with many long and hard fought rallies and consistently impressive retrieval and some crisp hitting of his own Simon went 2-1 up. Neil resumed his powerful hitting combined with some nice touch winners to take the 4th and make it 2-2. Fortunes fluctuated in the 5th and Simon timed his period of dominance perfectly coming up with his own brand of fine finishing to close out the match by winning the final game 15-13. Thanks to Mike Critchley for marking. The score line looks very harsh on Ted who as always put in a tremendous shift. 3 very tight games which around the 10 all mark could have gone either way. Darren seemed to find the shots at the right moments. Well done Darren who became the first person to retain the vets trophy in the modern era. Thanks to Alex Milne for marking. The longest and possibly hardest match of the night. Tim needed a quick injury break due to cramp at the end of the 4th. 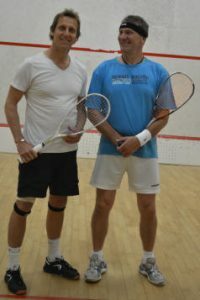 I was surprised either of them could stand let alone play squash after the level of effort put in. Rich took advantage winning the 4th game to make it 2-2 and then took the final game 15-12. Well played Rich. Congratulations to both players who always looked to play the ball which led to a good spirited game. Virtually no strokes or lets all game. Impressive.